Craigslist is an online community where you can buy and sell almost anything from clothes and accessories to vintage furniture and mystical treasures. It can be a great way to discover something totally unique while saving that hard-earned cash, but it’s important to keep a few things in mind before initiating contact with a Craigslister. 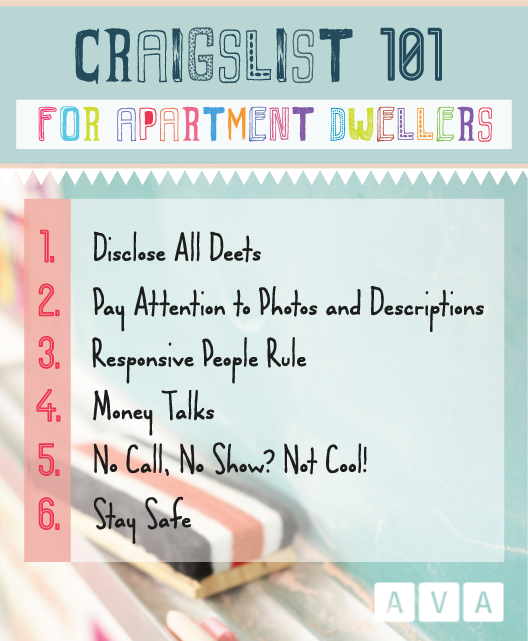 Here’s AVA U District’s list of Craigslist 101 tips! Disclose All Deets If you are listing something for sale, give the buyer all the available information about the item. Describe the item, list its model number if available, disclose the dimensions and don’t forget to list the price. Also make sure to list what neighborhood you are in (U District, obvi). This will cut down on unnecessary emails and questions, and will give buyers an idea of how far they need to travel to meet you. Pay Attention to Photos and Descriptions When browsing listings, look for ads that have a well-written description and well-lit photos of the item you are looking to purchase. Ads that are poorly written and don’t contain a photo are a good indicator that the seller was in a hurry to post the listing, and is probably not someone you will enjoy bartering with. Responsive People Rule Ask the seller a question about the item and use good judgment to decide if they will be an awesome Craiglist relationship. Only work with people who have decent response time and answer your questions thoroughly. If the buyer or seller won’t take the time to answer your questions, they may turn out to be someone who won’t keep an appointment if you decide to buy or sell stuff, or the item may not be as described in the ad. Money Talks Only bring enough cash money for your sweet find, as CL’ers usually don’t have change. Save yourself from a trip to QFC to break a large bill, and always bring exact change. If you are selling an item, have some small bills on hand just in case. No Call, No Show? Not Cool! If you make arrangements to sell or pick up a Craigslist find, and are running late or need to cancel altogether, be courteous and call the Craigslister to let them know. ‘Aint nobody got no time to wait around! Stay Safe Meet in a public place if possible. If not, bring a friend with you. Keeping your personal safety is of utmost importance, so be smart and follow your instincts.